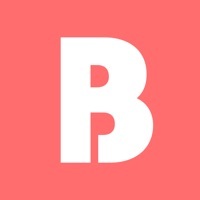 The Bump is the #1 app for first-time moms, providing features you won’t find anywhere else: + NEW: Planner+: Prepares every mom-to-be for each doctor visit + EXCLUSIVE: Inside The Bump: an interactive 3D visualization of baby's growth + Daily, award-winning pregnancy and baby editorial articles + Real-time answers to all your questions: “Is this normal?” “Is this safe?” + The largest catalog of baby products and reviews across all major retailers All of this in a voice that gets you and a design that’s ahead of the curve. 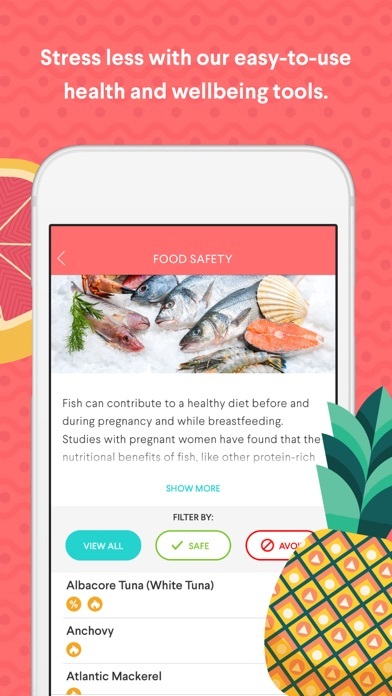 The Bump gives you trusted information backed by experts and science that you can understand—and unlike other Apps, we’re committed to giving it to you for FREE. Here's what our users are saying: “LOVE IT! I love how they use the fruit to let you know where your baby is at developmentally. Also, they tell you what is happening with your baby and provide additional tips and information.” -Nbcott ** FEATURES ** HOW BIG IS BABY The Bump is the original home of the cute fruit :) Prepare to smile and look forward to each week: The Bump compares your baby’s growth in utero to beautifully illustrated fruit (“Baby Is As Big As a Peach”) that’ll delight you and make you excited to share with friends and family. Plus, find comprehensive updates about the changes and developments happening to both your baby and body, and learn how best to prepare for them. 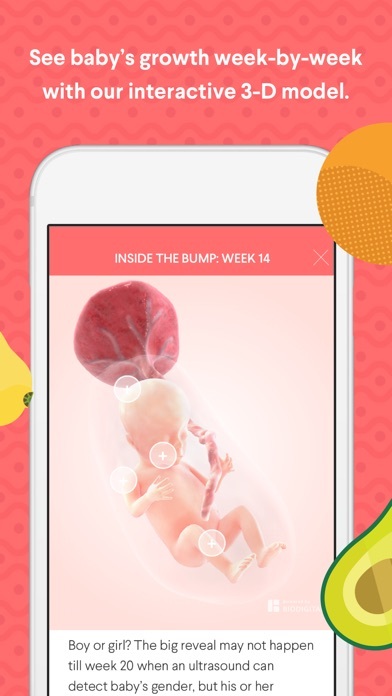 INSIDE THE BUMP An exciting and exclusive 3D interactive visualization of baby's growth week-by-week. Interact and learn new facts about baby and the changes inside your body. This uses BioDigital Inc.'s proprietary technology. DAILY CONTENT Everyday, the award-winning editorial staff of The Bump delivers fresh and relevant content for the specific week of your pregnancy. The articles are timely and extensive: always know what’s safe and normal; find out how to ward off morning sickness; learn the best things to pack in your hospital bag; and discover how fellow moms are embracing pregnancy and motherhood. PLANNER+ A new feature that equips every expecting mom with important information about their prenatal doctor visits. It suggests questions you may want to ask your doctor and integrates appointments seamlessly with your iOS calendar. REAL ANSWERS Exclusive to The Bump: The ability to ask questions and get quick answers from three different sources (1) The Bump editorial staff (2) The Bump team of experts, including leading doctors from One Medical, Maven Network and Reproductive Medicine Associates of New York (3) moms like you. REGISTRY The Bump is the #1 Baby Registry destination in the US, hosting over 1 million registries every year! The Bump has become #1 by solving two of Baby Registry’s biggest challenges: + The Bump has collected over 15,000 of the top registry products across Babies “R” Us, Target, Amazon, buy buy Baby and Walmart, WITH REVIEWS for most of the products. This will quickly grow to over 100,000 products so you can find everything you want and need for your Registry. + The typical mom-to-be will register at two stores because there are always some special items that require a special, secondary registry. The Bump has you covered! The Bump will AUTOMATICALLY track all your registries across each retailer so you can keep tabs on what you’ve registered for, what’s been purchased and what still remains. BELLY AND BABY PHOTOS Document your pregnancy by creating a weekly album of your happily growing belly. And once baby is born, the album expands to track the first amazing year of baby’s life. CUSTOMER SERVICE The Bump team reads every email (and responds to almost all of them personally), answers each phone call and takes to heart all of your reviews. And unlike other pregnancy and baby apps, you’ll never have to pay for this service. This is your pregnancy. This is your baby. This is your app. Have a problem, don’t hesitate to let us know. Love The Bump, please share the love on the App Store and with your friends and family. I’m expecting my first child in October 2019. I have downloaded millions of pregnancy tracking apps and this one takes the cake! I love how everyday they have a new object to compare my baby’s size to. I love reading their helpful tips and stories to relax my worried mind. When I found out the hubby and I were expecting I downloaded all the pregnancy apps out there. Weeks later and this is the only one I use every. Single. Day. It’s bright, colorful, has articles that are both informative and fun! Highly recommend! Not only do you get helpful articles, there’s your weekly size updates, 3D weekly updates for you and baby. My FAVORITE is the daily size updates “Today your baby is the size of a ______.” The best best best part! 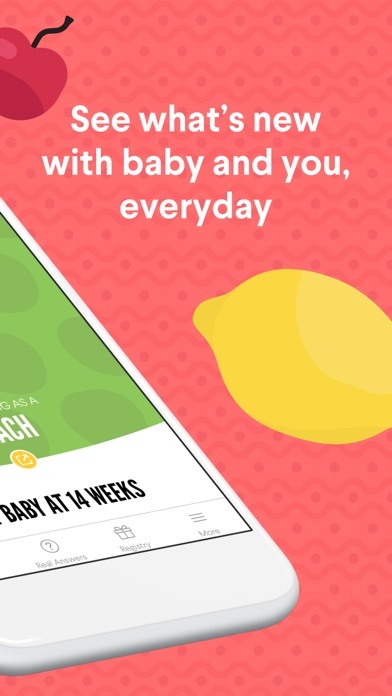 I've really enjoyed the app through my pregnancy! What I don't like is the new update makes the app not even open. So there needs to be some bug fixes before I can even use the app anymore. I have a couple of baby apps and this is my favorite. I love that it gives me an update of my baby’s size every single day! Love it it’s been so helpful!!! 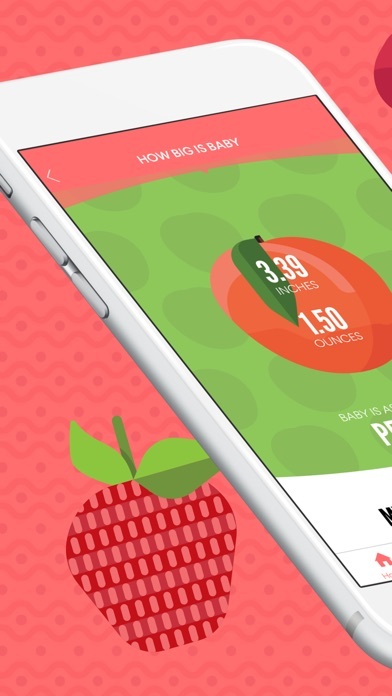 Great app for those parents who likes to keep track of how many feedings, changes, pumps etc. very easy and friendly use. Its very helpful! Very informative app. Keeps me up-to-Date with all the changes going on with the pregnancy. It’s been over a decade since I’ve had a child. This app really helps with every step so far!! I love this app! So much information available for moms. Would definitely recommend this to other mommas! I loved using this app throughout my entire pregnancy and even into postpartum. It had tons of useful information that helped me learn and prepare. It’s even been nice now that our sweet girl has arrived. Would recommend this to all my friends. Love the app. Very informative. Very useful. I wish you could pin/save articles to get back to them at a letter date. Some have a lot of information I might not be ready to dive into just yet but know I’ll want to revisit later ! Besides that. Awesome app. The app is very informative I do appreciate the many ideas and good information on the start of conception until the end when you’re ready to deliver. What I’ve appreciated most about this app is that the information regarding my baby at specific ages has been spot on. The topics of reading seem to be up to date with latest information. It’s been quite awhile since I followed pregnancy with such interest. Love watching and reading about the amazing miracle of life forming in our daughter. Love the 3D models. I love being able to see baby and it’s developments in 3D as well as what’s going on with my body! This app has tons of information and is really useful. I so much love this App! Very helpful in letting me know what's going on in my body. Also helps to relieve anxiety and answers most of my burning questions or concerns. I also enjoy and look forward to the daily comparisons to what the size of the baby or body part size is like to regular everyday items or food. I’ve tried multiple pregnancy apps and I like this one the best. I like the daily updates on your baby. Other apps only update you on your baby weekly but this one has a different update every day and it’s fun to get something new about your baby. The Bump was invaluable when I was pregnant with my first child and looking for information about baby's development. Once he was born, the app has become fairly useless. Suggested articles don't match the pace of my baby's development, or it's information that's a waste of the precious little time I'm trying to prioritize. (Example: "Forget Mama and Dada, This Baby's First Word is Google") Because all babies develop at different rates, I can understand how it would be difficult to tailor articles to everyone. However, there are certain milestones to look out for. If the app algorithm can be set to get me those specific articles when I was pregnant, then the same should be done after my baby is born. I don't need stories about raising a baby; I need the strategies to deal with the challenge he's currently having or the milestone that's coming up next, and for that, you'll have better luck looking elsewhere. I love how it tells you the size of the baby and the size of different body parts! I really enjoy scrolling trough the weekly updates and seeing the information about baby’s progress. The ‘real answers’ portion seems superfluous, I would rather ask my girlfriends or midwife any questions I have but I get that not all of us have this support. I appreciate some of the articles and enjoy getting to click on what interests me. The digital view of baby’s growing body is fascinating! Great pregnancy app! This is an amazing and FREE app that is full of useful information for all stages of pregnancy. I absolutely love the week by week updates of you and your baby and that changes and growth happening each week. I have recommended this app to all my pregnant friends and am so grateful a friend told me about it. Loved the simulations of my and my baby’s anatomy. Loved the countdown and progress counters. The “Real Answers” I personally found useful and more often than not, found insight on my questions from other moms. Very exciting getting to a point where the app tells me I have only 4 weeks to go to see my handsome baby boy. I love the bump! Im so happy to have found it. This app is so informative & I love the tracker! I like that it doesn’t have all these crazy ads like other apps do. I’m using this with my daughter. It’s fun to see how she’s progressing. My favorites are 3D & the message of the day telling how certain parts of her body relates to things you know so it’s easy to visualize. This is a fun app. Love this app for both of my girls, it has the best info! This app is great for new and experienced moms or dads. The forums are helpful for parents, they provide accurate information besides a few typos they definitely do help study for what’s to come! I’m a first time mom delivering at a birth center and because I like to ask questions and be informed with everything my midwives were very surprised how much I knew!! Perfect for first time babies!! I used this app all through my pregnancy and am still using it for my 3 month old. I like reading the articles every day and when I was pregnant I LOVED seeing the renderings of what my growing baby might look like week to week. This is a great way to learn about the growth of your little one! I look everyday for the daily facts on the size and weight. Now, occasionally that fact doesn’t update- but that’s a very small complaint. Love it! Love this app! Especially love the “real answers” feature where you can have lots of your questions answered by other users. Extremely helpful!! This app is very helpful- gives you day by day articles about frequently asked questions, open chats for any questions you do have for other users to give input. Awesome app! I wait till midnight every night just to read a new fun fact about my baby! It’s so amazing the things this app teaches you! I’ve recommended it to friends! I definitely definitely give it 5 stars! Love the app. Everything about it, but I am unable to see the part in the 3D Visual about MY BODY. I religiously looked at this app nightly for the first year of my babies life. It was so relaxing and informative. However, I’m disappointed to not have nightly articles show up for beyond the first year! I truly love this app and help me during my pregnancy to know exactly what was going on during the weeks of pregnancy and postpartum after you have the baby. Also, keeps track from day one when the baby is born and afterwards so it’s right on the dot on all the questions that you may have on breast-feeding and what is normal with your newborn and what not! Great app to have! With four grown kids it’s been a while since we went through a pregnancy. Now that we are expecting our first grandchild this App has become a “go to” resource to track the development of our grandchild, and also our daughter in law’s progress! It is really packed with useful and current information. Highly recommended! It’s so fun as a future Grandma to be able to share and read the changes and progress each week with my daughter. Highly recommend it!! !